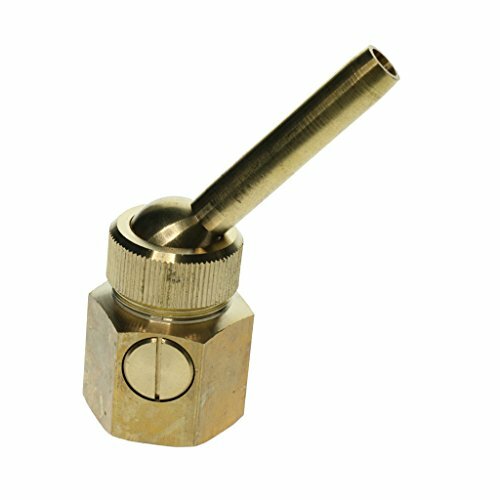 Homyl Fountain Nozzle Sprinkler Water Spray Head Straight Shape Brass, Single nozzle with valve, direct flow - DN25 Internal Thread | Fountain City Art Ctr. - Made of quality brass material, corrosion resistant and durable. - Single nozzle with valve, direct flow, the water column clear, smooth lines flowing. - The axis of the nozzle can be adjusted at ±10 degrees. - With beautiful shape and convenient installation, it can be adapted to a wide range of ponds and fountains. Please allow 1-4mm error due to hand test. With beautiful shape and convenient installation, it can be adapted to a wide range of ponds and fountains. Made of quality brass material, corrosion resistant and durable. Single nozzle with valve, direct flow, the water column clear, smooth lines flowing. The axis of the nozzle can be adjusted at ±10 degrees.